At least 2 samples of each size and paper type with custom branded examples. Seeing the quality of our paper and custom branding. See how custom branded examples look in both the white and brown paper type. Our pre-rolled cones are designed to fit perfectly in all standard knockboxes, but double check fit with a sample pack. Not sure what pre-rolled cone size or paper type you want for your pre-rolls? Our sample packs come with a couple of each 109mm, 98mm, 98mm Slim, 84mm in both standard white and brown paper types - you will get samples of both plain pre-rolled cones and custom branded cones. You will also get a couple hemp blunt cones and other speciality cones depending on availability. Sample packs are perfect for deciding which paper type looks and smokes the best for your flower. Our custom branded examples will help you see what different colors and logos look like printed on the different paper types. Our pre-rolled cones are designed to fit in all standard knockboxes, but since there are various types of knockboxes and new machines, it is also a good idea to test some samples to ensure you get the perfect size cone for your equipment. If you need a custom size or are looking for something specific, please contact us! Sample packs come with a couple of every size cone - 109mm for 1 gram pre-rolls, 98mm for 3/4 gram pre-rolls, 98mm Slim for a long and skinny half-gram pre-roll, and 84mm for the standard, short half-gram pre-roll. Make sure you get the right size for what type of pre-roll you want to make and what size your equipment is set up for! 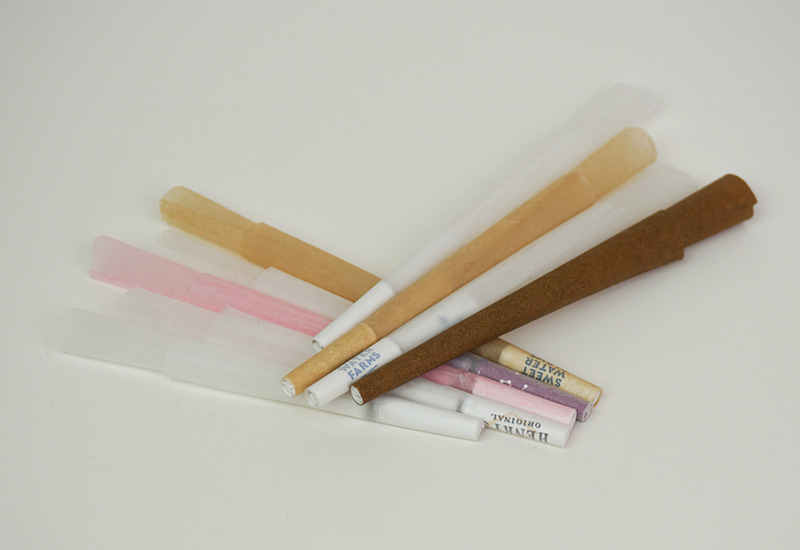 We have the widest variety of paper types to choose from for your pre-rolled cones. Our standard white and brown paper types are ultra-fine French rolling paper made from flax, which is also called rice paper by other companies. We also offer 100% hemp, ultra-fine rolling paper and hemp wraps for pre-rolled blunt cones. If you are looking for any special paper types, please contact us. If you are ordering custom branded pre-rolled cones, you need to make sure your logo looks perfect. Sample cones are great for seeing examples of other brands custom branded cones. You can see what different colors look like printed on the different paper types.